This post is an excerpt from my upcoming book, “Imagine Darkness, the making of the simple universe.” in part reiterating the points made in an earlier post, titled “Dark What” (June 2012). It is updated with new information and support from some new findings by astronomers. Thanks for reading it. I would welcome your thoughts and comments. 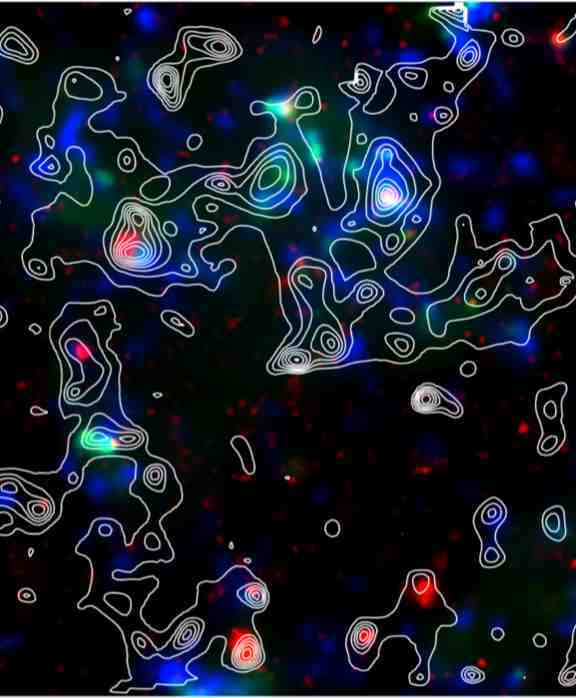 The image below is a “dark matter” contour map of a segment of a Hubble image. According to Richard Massey, the colored points in the image are ordinary matter, i.e. stars, galaxies and clusters in the Hubble image. The contours then show the gravitational lensing intensity surrounding each of them, Massey calls these areas “dark matter,” scaffolding within which new star formation is encouraged or supported. My alternative construction of this data is that the ordinary matter consists of high energy concentrations in the electromagnetic ether, concentrations we identify as stars, galaxies, and clusters, and what the contours actually indicate are the intensity of field distortions these create in their vicinity, the otherwise invisible energy distortions that, it is true, do encourage the formation of what we will ultimately see as new stars, galaxies and clusters out of the energy of the field. 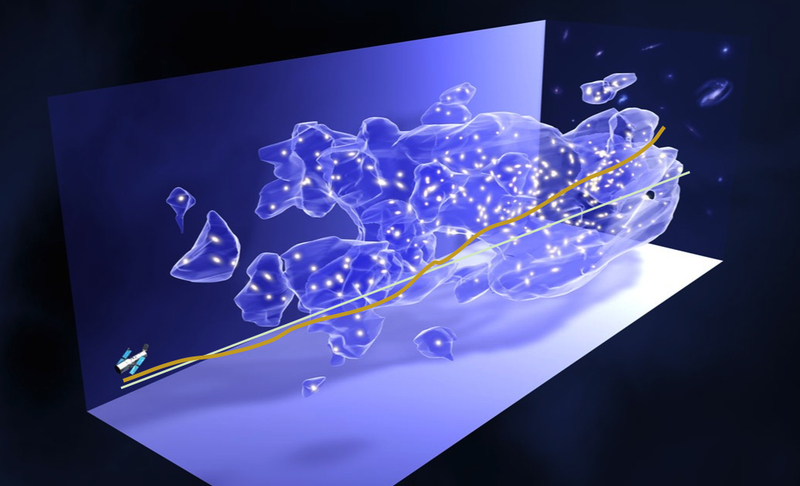 In the computer simulation, below, one can visualize the location of field distortions surrounding the high energy concentrations we perceive as stars, galaxies and clusters. The apparent hard lines of the cloudlike forms are merely a representation of a selected threshold of perception. In actuality (if I may use that term) the intensity or energy level of these distortions probably follows a smooth curve, as other fields exhibit, i.e. falling off in intensity as the cube of the distance from the core. One can generalize from this conceptualization that we here in our galaxy, in fact, undoubtedly inhabit just such a region of “dark matter”, but we cannot detect it as Massey has been able to do by using Hubble images of regions at a distance from us. We can also see these regions as analogous to what we do perceive locally as magnetic, electric, and electromagnetic fields, which we also know are not particulate. This can also be seen as an explanation for the apparent “curvature of space” envisioned by Einstein. Light, itself, seen now as a visible range of frequencies carried on the background frequency of the electromagnetic ether, not through the vacuum of space, would naturally have its path distorted in traversing these regions, thus explaining Eddington’s 1919 observation of the curvature of light predicted by, and seen then as confirming Einstein’s relativistic model. So here is the truth of the mysteries of “dark energy” and “dark matter.” All of everything is made up of energy, in various states depending on how and in what region of the universe it arose. That field, which we have chosen to call the ether, is all there is of what the mystery lovers among us choose to call dark energy. It is a field that while internally turbulent is fixed in its location. It is not going anywhere. Those regions of that field that have undergone distortion, increases in energy density where they surround and permeate those high energy, perceptible entities that have, up until now, been identified as objects, with a property called “mass,” is what those same experts have called dark matter. Our portion of the universe, our star, our galaxy, have taken part in this process. The energy concentration we call the milky way has generated a region of distortion of the field, a region characterized by a higher energy density, a region of dark matter so to speak. We live in that region. It surrounds and permeates us and affects the way our stars and planets behave, as we affect it, as Mach pointed out so many years ago. Powerful evidence of these assertions have appeared in two studies in recent years. British researchers, M. Lockwood, R. Stamper, and M.N. Wild published in NATURE (Vol. 399, 3 June 1999. Pages 437-439), a paper entitled A Doubling of the Sun’s Coronal Magnetic Field during the Last 100 Years. They point to a doubling of the intensity of the sun’s field in that period. The reason for this occurrence is obvious in the model of the simple universe. Our entire solar system has moved into a region of increased energy density, that is, we have moved closer to the center of a system surrounding a high energy concentration in the field. One can picture this clearly if one imagines the orbits of our little group of planets around the sun. If the sun were fixed in position relative to the ether, or one fixed reference frame. then the planetary orbits would describe a series of concentric ellipses. But the sun itself is in motion, and into a region of higher energy density. One has then to imagine the orbits of our system as describing helices as the center of their rotation itself moves laterally relative to the ether and relative to other systems also in motion. (See Jamal Shrair, http://www.helical-universe.info) The fact remains, our solar system has moved in the last 100 years deeper into a region of higher energy density and the result is that our sun’s magnetic field has doubled in strength. So here arises the need for a new vision of the precise notion of gravity, if “dark matter” is not actually subject to its “relentless pull”, but is a totally different kind of manifestation of the structure of the field; and a new look at expansion, assuming it really exists, as probably the creation of new concentrations (stars, galaxies, clusters) arising with help from the universe’s absorption of energy from the surrounding (and permeating) field of the cosmos.